The town’s business improvement district (Bid) is considering using light beams to scare the birds back to the countryside. Fears have been raised that the gulls are damaging buildings and causing unsightly mess in the town centre. Yesterday the RSPB warned conditions would likely have to be in place to restrict the intensity of the laser. Stuart Benn, a conservation project officer for the charity, also suggested the measure was unlikely to succeed on its own. He said: “People have tried all sorts of things over the years. This might be the thing that gives them a fright the first couple of times. “These birds are smart though and they could quickly realise it’s just that light again and just ignore it. 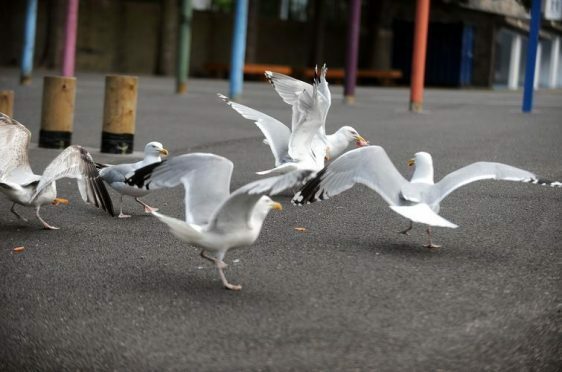 The Bid has set a target of ridding the town centre of gulls during the next year. Firms at the Greshop Industrial Estate in Forres are also considering laser treatment for the feathered foes. Daniel Lyons, owner of Lyons Environmental Services, has been working with companies at the site. The Elgin-based pest control company is currently in contact with suppliers about using the laser technology in Moray. Mr Lyons said: “Birds see ultra violet light. When we see a laser we just see a spot on a wall – birds see the whole beam so it looks like a big green stick to them. “There’s a program to run a pattern across a roof so they are put off from landing and nesting there. “It’s not designed to actually hit the birds because they would quickly realise it doesn’t hurt. They’ll think ‘It’s that light again, I can live with that, it doesn’t even tickle my feathers’.